Legal powers application – when these are all ready. 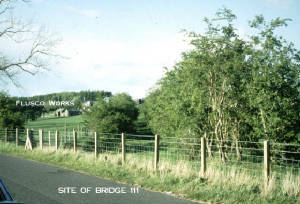 We are collating information about land ownership and have consulted many landowners at different stages of the project. If you own part of the trackbed and we have not contacted you, it is probably because your details are not in the Land Registry or former British Rail land sales records. Please contact us so that we can keep you up to date with progress and discuss how the railway might affect you. at Flusco, before development began. 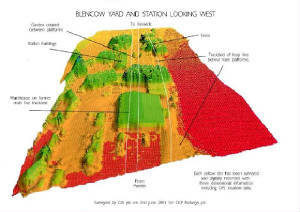 Digital scan of the station site at Blencow from the helicopter laser survey. Different colours represent different elevations. moveable items such as containers.